My piece for the Elie Wiesel project is meant to symbolize the physical and mental scars left on the victims of the Holocaust. There is a scar on her arm shaped like the Star of David to stand for the patches the victims were forced to wear. Her hat is striped like the pajamas they had to wear and her head is shaved. The pain these unfortunate people went through is unimaginable and depressing. I decided to use charcoal pencils and kept the woman black and white to represent the dark, depressing times of the Holocaust. 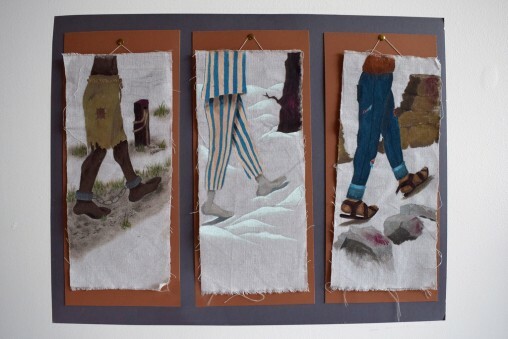 Parallels is a social justice piece meant to bring attention to the cyclical nature of history. Using acrylic paint on raw canvas, I painted three panels, each depicting a different instance where human rights were violated. I used many shared references between the panels to help push the idea that history repeats itself if we don’t stand in its way. Even though the situations were unique, every instance where we allow hate to win shared the same characteristics: a wealth of indifference, a lack of compassion, and the absence of any human kindness. I truly believe that injustice anywhere is injustice everywhere, and this piece is meant to be a powerful depiction of that thought. Left Unspoken is a book filled with Holocaust Poems that show the inhuman stories from the Holocaust. The images in the book were painted with acrylic paint. The book is burned to make emphasis on the destruction of the Holocaust. These images depict the emotions from the poems. In some poems, the images go from light and happy to dark and depressed as the poem progresses. The pictures show the injustice done to the people of the Holocaust. Most people from the Holocaust could never tell their stories, so “Left Unspoken” gives you the emotion they felt. This piece was made to symbolize the sadness and distress of the Holocaust. The lowkey values show the darkness surrounded the people of the Holocaust. The subject is looking down because at many points the people did not know if they were ever going to get out of the concentration camps. The numbers represent the tattoos of the people and are coming from the subject’s head to symbolize the title “Never Forgotten.” The phrase “Never Forget” is said as a command and I chose “Never Forgotten” as the response to that. The Holocaust and all those people will never be forgotten. Throughout the Holocaust millions were subjected to unimaginable circumstances, identities stripped and fate rewritten. When I saw the photos of children the pain and fear was evident through their eyes. Throughout history, many are willing to forget tragedies and focus only on great accomplishments and the future, however it is important that society understands and remembers the heart wrenching story, such as these children, to avoid tragedies from continuing to repeat. Humans have a duty to delve into theirs and their ancestors past, and learn from such mistakes, rather than pretending such things were never executed. Even today after “never again” genocides have happened all over the world, children are dying with no advocates. In my art piece I wanted to pay respects to these forgotten children, long lost in history texts, to give meaning to their death once again, inspiring others to protect possible future victims. The photo I chose is representing a Jewish boy in a concentration camp staring across a fence to a German boy. The nails scattered over the picture make out the Jewish star to symbolize the young boy. Insensitivity is a perfect way to describe this image. People were insensitive causing indifference in others and separating those you may have done no wrong doing. It is not right to separate people by who they are, where they came from, who they may know. Like in this picture, just because the young boy was a Jew he was mistreated. The Jewish boy was treated like he was worth nothing. As you can see the German boy is well dressed on the opposite side of the fence. Think deeper about others, feel for them, make a change for those mistreated by others. Acknowledge those whose rights have been violated. And the smell of the fresh bread. Everyone was together and there was nothing to dread. Where my home is now long gone. But I will keep my soul strong. I feel it sit with the love of Earth. Resembling the love that I will always hold. I made a violin to represent the hundreds of prisoner musicians that were forced to play cheerful music as they witnessed friends, strangers, and family members being sent to the gas chambers. 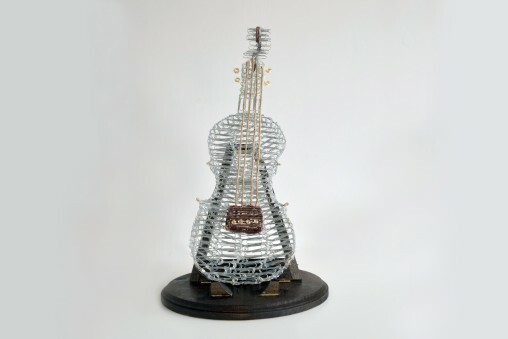 I made the violin out of paper clips because of the Paper Clip Project, a few decades after the Holocaust a middle school started collecting six million paper clips to represent the millions of people who died. One part of the Holocaust that has changed who I am as a person, is when the Jews would be beaten for little reasons. My art shows the part in the book by Elie Wiesel when he was getting whipped. In my art, it shows faces with only eyes showing how they only watched him. Except one man, he has a mouth and can choose to speak up if he dares. We all have a choice. Sometimes our environment or fear of what is to come can change our choices even if we know what is truly right. The work I created represents humanity’s perspective on the Holocaust. The reason I used black and white around the face is to make sure that the attention goes all to the tear and especially the eyes. The picture in the eyes serves as a reflection, it shows what the drawing is witnessing. The reflection is of a Jewish person behind a set of bars. The reflection in the eyes is different. In both eyes, you see the man behind bars, but in one eye the man is holding onto the jail bar and a tear is also in the left eye to represent the indifference of humanity. On the right side, a person is holding a rose instead o the bar. That rose gave strength and courage to the Jew that there is hope somewhere, during this tragic event in history.